This page created 23rd October 2000, updated 10th January 2006. Best on 800*600. Somehow the Wadham Stringer offering for a Dart body does not appeal to me. Really it is different only in detail from the Pointer, but the effect is stodgy. Less than a handful made it into the Greater London area. 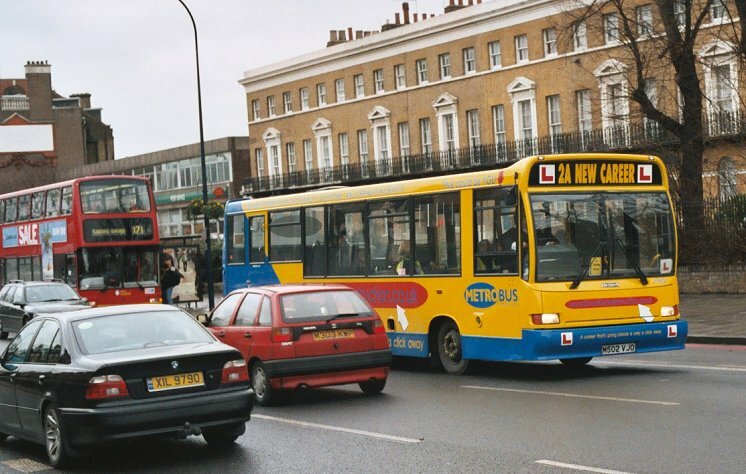 London Buses tried a demonstrator between August and October 1990, G895XPX operating from Peckham, Orpington and Willesden in turn, wearing red with a broad cream waistband. 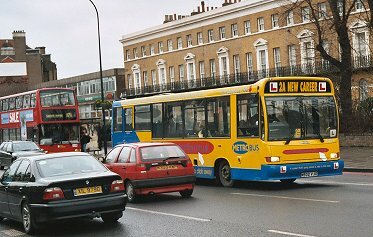 Capital Citybus was not a great user of standard Darts, having just two, of which 669, bought secondhand in 1995, was the only Portsdown model. It went into Capital Citybus yellow livery, with red lining. In January 2002 it went west, literally, to First Western National. East Surrey bought a Portsdown-bodied Dart in their early days. No 36 was a 9.0m Dart, delivered in 1991. They must have liked it, because when Eastbourne Buses upgraded in 1997 they bought three of their cast-offs. Marshall acquired the Dartline (DT) design rights from Carlyle when they ceased bus building, and softened its startling modernism with curves instead of corners. The C37 just didn't have the same flair as the earlier version. On Dart chassis the body only just appeared in Central London, on a singleton for R&I Coaches (although a few more came on MAN chassis, as MTL London's MM class), but some made it into the outer zone. In practice, this version was killed off by the rush for low-floor Darts, but laid the foundations for Marshall's forays into Minibus building, and for the low-floor Marshalls to follow. In 1994 R&I Coaches bought a 9.8m Dart with Marshall C37 body as one of their mixed bag of Darts for North London tendered services. It was taken over with the company in 1995, by MTL London, who repainted it dull red, and subsequently taken over by Metroline. Four C36 bodies, only 9.0m long and fitted with a wheelchair lift in a level front entrance, were bought in 1992 by Thamesway for the East London Mobility Bus contract, on behalf of London Regional Transport. They were painted in London red with a broad yellow waist-band. Lucketts of Watford bought two 9.8m Darts with Marshall C36 bodies in early 1994, and registered them as L300BUS and L400BUS, in sequence with their two Dart Pointers. They were taken over by The Shires in January 1997 and operated from Garston on Watford services as 3103-4. In December 2000 Arriva The Shires took over the High Wycombe operations of The Wycombe Bus Company, a subsidiary of City of Oxford Motor Services. With the transfer came two Marshall C37-bodied 9.8m Darts with dual-doorway bodies, #503 and 504, which became 3833 and 3844 in the Shires fleet. Universitybus of Hatfield bought four in 1995, on 9.8m Dart chassis, as company for their Carlyle Dartlines, before moving to SLFs for their 1996 purchases. 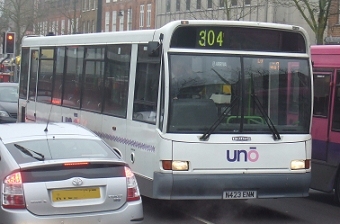 The white-liveried buses are employed on the Hertfordshire network around Watford and Hatfield. By 2008 the four Darts were thought redundant, but the acquisition of Centrebus' St.Albans operations brought a need to replace some of the older smaller buses there, and the Darts have stepped in, both the Wright Darts and one of the Marshall bodied Darts (423) being employed, albeit still in white livery. The other three Marshall Darts were sold in July 2008 to Halton Borough Transport. 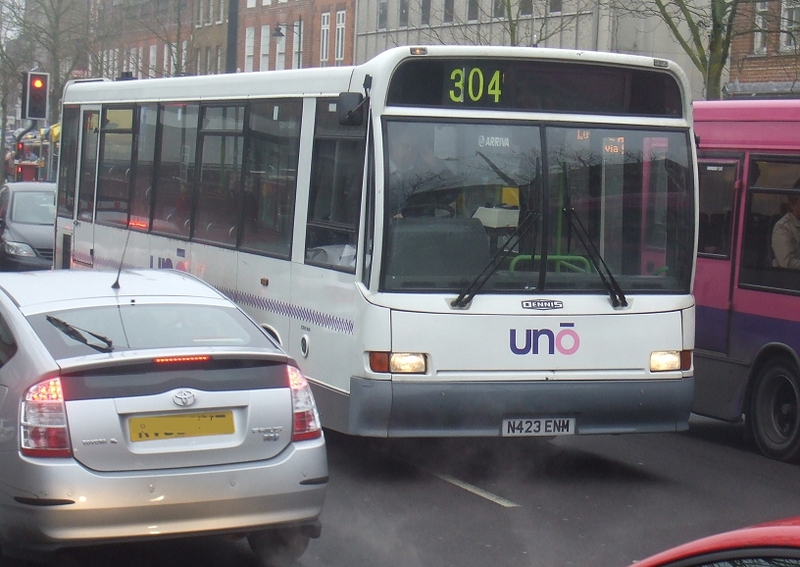 423 was working on the 304 in St.Albans in January 2009. Epsom Buses bought a single Dartline-bodied Dart, the body being of Carlyle styling but built by Marshall. 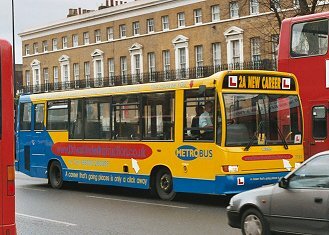 Initially it was in Epsom Buses' cream with a maroon skirt, but in mid 2001 it was repainted blue and subsequently downgraded to training duties as TR1. Overall yellow training livery followed in early 2005. In October 2006 there seems to have been a change of heart, because the bus was renumbered as LD1 and returned to passenger service on the 408. A repaint into red - the livery of Quality Line's bus services, followed. Metrobus bought eight of the City of Oxford Darts in March 2001, for use at Crawley. By the end of 2004 they had all been superceded by newer buses, and the decision was made to use them to replace the 9.0m Darts in the training fleet by these longer buses. Consequently all eight were repainted in a new yellow with blue training livery and sign-written accordingly. After initial introduction to training duties they were allocated 7762-5 at Lagoon Road (Orpington), and 7766-9 at Crawley. Training duties take the buses and trainees into London as well as the suburbs. On 28th January 2005 7762 and 7763 took a break at Camberwell Garage, and shortly afterwards were seen passing New Cross Garage. bus histories. photo references. Portsdown. Marshall. Ian's Bus Stop Dart index. DEL. Volvo B6.